Mumbai July 13 (IANS) Bollywood celebrities like Amitabh Bachchan Shatrughan Sinha and Akshay Kumar on Friday congratulated Indian athlete Hima Das who created history by winning gold in the women s 400 metre event at the IAAF World U20 in Finland. Held at Tampere Hima on Thursday registered a time of 51.46 seconds in the final at the Ratina Stadium to become the first Indian athlete to win gold in a world championship across all age groups. She also did well in the earlier rounds winning Heat 4 with a time of 52.25 seconds. She emerged on top in the semi-finals as well winning her race in 52.10 seconds. Amitabh Bachchan: Congratulation. Hima Das the first Indian women to win a gold in world athletic track event ever! India is proud of you. You have given us reason to hold up our heads high! Jai Hind! Shatrugan Sinha: Yet another brilliant performance from India s daughter... 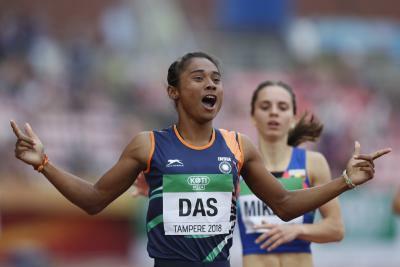 Kudos to India s Hima Das who made history by becoming our first track athlete to become a world champion at any level after winning the women s 400m at the U-20 World Championships in Tampere Finland on Thursday. Hima Das. Akshay Kumar: Historic! Congratulations Hima Das for winning India s first gold at a global track event in Under - 20 World Athletics. Nicely done. Farhan Akhtar: Congratulations Hima Das. 400 metre winner in world Under-20 championships. Proud moment. It is amazing that it coincides with the five year anniversary of Bhaag Milkha Bhaag and Milkhaji s biggest dream was to witness an Indian athlete win gold in track and field. Arjun Rampal: Congratulations Hima Das for this stupendous feat. The toughest race 400 metres. The first Indian athlete to win a title in any track event. Huge day for Indian athletics. Dia Mirza: Proud proud proud! What an incredible day Hima Das. India.